Public Lecture 1 (Leeds): Why Did Scientists Come to Write Autobiographies? Victorian Science Spectacular: Registration Open! Roll up! Roll up! For your chance to see science, Victorian style, you need to register via the University of Birmingham website here. If you have any problems registering via the website, you can email the workshop organisers to register. The performance is free, open to all ages 12 and above. The performance will start at 6:30pm on Saturday 9 November 2013, in the Poynting Physics Building, R13 on the campus map. You can download the poster here (pdf 2MB). 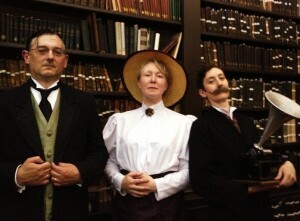 (from left to right) Professor Marmaduke Salt of the Royal Panopticon of Science (Iwan Morus); Miss Ann Veronica Stanley, learned scientific gentlewoman (Aileen Fyfe); and Mr George Wells, inventor and brother of H.G. (Katy Price). What futuristic marvels amused the Victorians? We bring you the phonograph, magic lantern, animated photographs, and chemical and electrical experiments from over a century ago. How have attitudes to innovation and the future changed since then? Registration is now open for the first of our workshops. Attendance, including refreshments, is free, but registration is essential. To register, email the conference organizers at oliverlodgenetwork@gmail.com by the 1 November 2013. When you email to register, please could you also let us know if you have any dietary requirements. Further details about the workshop are available on the workshop page. To download the programme and poster click here (pdf 140KB). The poster and programme for the first of our workshops is now available. Click here to go to the workshop page or here to download the poster and programme (pdf 140KB). This first workshop, which will be held at the University of Birmingham on Saturday 9 November 2013, focuses on Oliver Lodge, physics, and civic science in the nineteenth and twentieth centuries. It features a number of talks, a visit to view a specially curated collection of Lodge materials in the Cadbury Research Library, and a roundtable discussing Lodge’s work, career, and times. Attendance is free and open to all. Details about registration will follow.